Christina Lauren is the combined pen name of long-time writing partners / besties / soulmates / brain-twins Christina Hobbs and Lauren Billings. 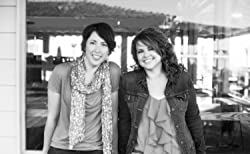 The co-author duo writes both Young Adult and Adult Fiction, and together has produced thirteen New York Times bestselling novels. Their books have been translated into 28+ languages. Click here for more stories by Christina Lauren. Parental figures can be hard to deal with, especially when you’re a teenager. It seems like they’re always yelling at you to study, or to stop going out all the time, or else they’re stalking your significant other, or they’re making doorknobs vanish so that you’re trapped inside your own house as punishment for wanting to move out after you graduate from high school. It’s a rough time, no mistake, and explored to chilling effect in Christina Lauren’s The House.